My husband LOVES Oreo Truffles… almost a little too much! Sometimes I think he would feel complete in life if he could eat those for the rest of his life! I love them too, but I also LOVE brownies! Hello, come to mama! These look fabulous. Chocolate, cream cheese, and Oreos could never be bad! Hooooly lusciousness. These look awesome. Gorgeous pictures and post! I agree with Ashton--I love when bloggers share creative ideas (because let's face it, we all get the same ideas sometimes!) but it's very classy and nice to know you truly are an awesome blogger, not just for food and content, but for YOU! These look beautiful! Can't wait to try them! Now to find how to follow you..
Oh.wow. These look insanely amazing! I am always thinking of food, too. What food blogger doesn't? Me thinks you should be training Me :) Fabulous brownie and such a beautiful blog! These look so fudgey and delicious. Definitely one for the weekend. Oh my goodness these look so delicious. These are going on the must try list. Thanks for the shout out Nikki! I love the look of these and I need to try your brownie recipe! These look amazing and I really want to try them, but I'm a little confused! I'm not seeing that melted chocolate layer in these pictures? And did you put extra crumbs on top? Just want these beauties to turn out perfect and exactly as you intended! Thanks! The melted chocolate layer hardens on top... like the oreo truffles have a harder chocolate coating around them, this layer is just layered on top. It hardens up and is not runny once it sets. And yes, I sprinkled some extra garnish of Oreo crumbs on top immediately after putting on the dipping chocolate (before it set) so that they stay in place. You can do this but it is not a must, its more just for presentation. I hope that helps! OOO, these sound so yummy! I think I'll try these for my husband's business partner, who absolutely loves when I make oreo truffles. Thanks for sharing! These look fabulous! Brilliant idea! These would disappear with in minutes here! everything i love! brownies, oreos, chocolate, cream cheese! just add some peanut butter in there somewhere! beautiful pictures too! can you tell me the name of the font that you used on brownies? i love it! I just finished making these :) easy enough to make and they look delicious. I did forget to set aside some Oreos to crumble on top though :( I hope they're good! Had trouble with this recipe. The Oreo layer does not stick to the brownie layer so when I cut them they separate. Any suggestions? I had the same problem. I wonder if placing a ganache layer on the brownies when they are fresh out of the oven would help , then place the Oreo layer, then the melted chocolate layer once cooled. Del. Ici. Ous! Yes, absolutely. I may have to try these...like ASAP! I'm totally going to make these today! Everyone in my office is SO excited :) Thanks for the recipe. They look soooo delicious and I wanna try them, but we are only 2 people. Can I freeze them ? This sounds SO INSANELY delicious!!! I must try it today!! Thanks for a fantastic idea!! These look so yummy!! I cannot wait to try them - I bet my husband will love them! Stopping by from TT&J - Have a great weekend! These look sooo good! My hubby is a major brownie man and with the oreos and cream cheese, these sound amazing. Will definitely have to try them. Thanks for sharing your recipe! I made this last weekend and they were very tasty!! My brownie layer, however, came out cakey and not fudgy like yours. Is there supposed to be oil in the recipe? Mine turned out cakey, too. And the oreo crumb/almond bark layer did not adhere to the brownies - when I cut them up, they separated. Hmmmm. I might spread a little melted chocolate between the two layers and "smoosh" them together to make them stick! After the oreos were crumbed I found it very easy to just put the cream cheese into the food processor. Worked great! Made these as a dessert selection for a progressive dinner. I was dessert hostess, and thought it would be nice to offer something with chocolate. Came across your recipe, and the brownies looked delicious and fairly easy to make. I have a few tips for those of you who want to try this recipe, and hope your brownies turn out better than mine. #1 I did not have butter on hand (which is rare for me!) and used margarine instead to make the base brownie. This part of the brownie was sort of bland and not very moist...maybe because I didn't use butter...? Certainly didn't look as nice as the pic above. #2: i forgot to reserve the 4-5 oreos for garnish, so my oreo truffle layer was dry and crumbly and I couldn't understand why...until it was spread out...next time I will either reserve the few oreos or just adjust and use more softened cream cheese. Either way, this was hard to spread over the brownie layer. #3: I barely had enough melted almond bark to cover the top (I used the recommended amt chef gave), so next time, I would use a few more ounces of almond bark. Finally, I made these a few hours before I would be serving them, so I left them to "set" in fridge (as indicated) but they really didn't need too much time, maybe 20 min would have sufficed. They were difficult to cut and serve, and crumbles a lot while eating. I left them on my counter overnight after serving, and they were a much better texture and easier to eat, softer than night before. I might try these again knowing that first batch had some glitches. I doubled the cream cheese because the consistency seemed very dry. It stuck to the brownie mixture really well. These were very rich and yummy, and really pretty too. I had the same problems as everyone else! Mine were really cakey, so dry in fact we didn't even really eat them. Also, the oreo layer did not stick to the brownie part. I thought it was just me but I'm glad I'm not the only one. Not sure what I could have done different. As I began reading the recipe a bit of clarity sunk in.... 'start with 4 ounces of soften cream cheese'....... When I first read ingredients list and saw 4-8ounces cream cheese, I'm thinking 4 eight ounces pkgs! Wow that's ALOT of cream cheese. LOL Recipe will definitely get made! Thanks! I noticed this brownie recipe only has 1 cup sugar where your original brownie recipe had 2 cups, does that change the consistency at all? I'm currently trying these with mint oreos. I'm excited to see how they turn out! oh my goodness! Thank you SO MUCH for catching that! That was a big WHOOPS on my part! It is still 2 cups of sugar. Really, thanks so much and have a great day! You will have to let me know how you like them! I made these for my hubby's poker, and let me tell you they were gone in 5 minutes! All the guys were requesting that I make more while they played so they could enjoy more on their "break"! :) Thanks for posting yummie recipes. I use a lot of them and every one is enjoyed by family and friends! Thanks for keeping our tummies full with yummie food! Omg these look like heaven! I have the same issue as you do, I think about food ALL the time, I love food! And I love making new homemade concoctions! Keep it up girl, your food looks delicious! I made these and they looked delicious. My only thing is the chocolate on top hardens so when I cut mine the chocolate cracked and really looked bad. I'm thinking maybe cut them after you spread the chocolate and then refrigerate? Just made these, one tray with Oreos, one with Andes mints !! Yum!!!! Made these yesterday! Super yummy.. My kids scarfed them. Thanks for the great recipe. I found these through pinterest and made them for a Halloween party I'm going to tonight. Instead of chocolate on top, I put ganache that I had in my fridge. They are INCREDIBLE! What a brilliant and tasty idea! Thanks for sharing your creativity! you should make a video!! please do!! Mine turned out great! I'm making them for a friend overseas and was going to send them when I realized I used cream cheese!!! So I'm looking for a good substitute for cream cheese that doesn't need to be refrigerated.. Any ideas? Maybe Betty Crocker cream cheese frosting? thanks for this recipe! Yes, I would clarify more on the cream cheese. I seriously had out FOUR BLOCKS of cream cheese ready to add in one at a time. I put in two blocks before reading through all the comments and received this clarification!!! Hopefully, the two blocks won't be too overbearing because I can't start over now. This is the greatest recipe ever! I'm so happy I stumbled upon it and thank you so much for sharing! I've made at least 5 batches already for Christmas parties and they've been a hit every time! Hi nikki! I'm in the uk and have been wanting to make these for ages. Just set about converting the recipe from cups... Just one question though I have mostly made brownies with either dark sugar or golden caster sugar and while converting I have the option of both as it states 1 cup of caster is 225g but brown sugar is less. Which do you use? And is 1 cup 225g over in the states? I would love to make these asap! BUT it doesn't say how much cocoa to use so, how much?! Hi, I saw this recipe on Pintrest and made it for our staff in December. I had some of the same issues mentioned. I made some adjustments to the recipe and I have to see that these are absolutely SUBLIME! 1. I used two 8 oz packages of cream cheese. 2. I did not use the almond bark/melted chocolate because of the adhering problem that others mentioned. Instead, I made a Boston Cream Pie-Style topping which, when cooled, became semi-solid instead of rock hard solid. The recipe for the topping was 6 oz of semi-sweet chocolate chips, 4 TBSP butter. Melt the two ingredients together and stir constantly in a heavy duty sauce pan (I used a dbl boiler). Add 4 oz of whipping cream in a steady stream to melted chocolate & butter mixture. Stir until well-blended. Pour onto and spread over the Oreo truffle layer. Thank you for the really great recipe. Oh, how I wish I had read your comment a few hours ago! I made mine with the almond bark and it is, like you said, rock hard solid. I even used a little less than called for so the layer isn't terribly thick. It's so hard to cut through...it just mashes the brownie and Oreo layer and cracks apart wherever it wants to rather than where I want it to cut. Next time I will for sure use your topping recipe! My reply didn't show up looking like a reply, just another comment. That ^^^ was a reply to Kara Clayton. Thanks! The brownie layer didn't set! I made these with a twist. My hubs LOVES the combo of mint and chocolate and so I used Mint Oreos and used white chocolate with green food coloring and peppermint extract for the chocolate layer. SOOOOO good! Thanks for the idea! I made these yesterday. I followed the recipe exactly. I used 8 oz. cream cheese. The brownie and the cream cheese/oreo part were excellent. I would probably use something different than almond bark next time. Definitely a great recipe. I had no problem with the cream cheese and brownie coming apart. And the brownie was nice and fudgy. I made these brownies for my boyfriend for Valentine's day this year. He loves brownies and Oreos so I had to make these asap. I made the brownies and followed the recipe exactly and it came out super candy. I had to bake it double the amount of time because it was so soupy and not Don yet. Not sure if something is missing from the recipe. Not very happy with the outcome of them. I had to cook mine for 30 minutes too. They were still very soupy in the middle after 25 minutes. These taste great!!! But how in the world did you get your cuts to look so pretty? My almond bark top layer is practically rock-hard. I even used a little less than called for so the layer isn’t terribly thick. It’s so hard to cut through…it just mashes the brownie and Oreo layers and cracks apart wherever it wants to rather than where I want it to cut. Not pretty...nothing like your picture. And with the cream cheese in it, are these supposed to be stored in the fridge? It only says to put in fridge until set. I just made these. I had the same problem as other bakers, I noticed the truffle layer didn't want to stick to the brownie layer. Now mind you, I have cut into these brownies yet. I had to cook mine 35 minutes. I decided I was going to show that truffle layer who was boss! When spreading anything, I like to use my small, offset spatula. I used a little force and "made it" adhere to the brownie layer. There was no muss, no fuss. I then melted a 12 ounce bag of semi sweet chocolate chips for the last layer and spread that with my trusty off set spatula. Looking forward to cutting into these bad boys tomorrow when we celebrate some birthdays. I'll be bringing them close to room temp before cutting. Hi. Stupid question, but how many oreo cookies are there in the packet you refer to? Thanks! I just finished making these for a dessert bar at school tomorrow. I didn't have any almond bark so I used chocolate chips instead. One thing I did that I always do when I make chocolate peanut butter bars is let the chocolate cool for a short time but not until it's all the way set. I get it out when I can cut it without them cracking, then stick them back in the fridge until serving time. Can't wait to taste them tomorrow! I made these for a gathering last week and it was the only pan of brownies that was empty. They were delicious. Thank you for an awesome recipe! I'm exited to try the idea with other truffle recipes! Oh, and I froze my brownie layer before putting the truffle layer on top and it spread like a charm! I also omitted the bark and just sprinkled crumbled Oreos on top. Other than that I followed the recipe as written and it turned out great! I would like to try making these brownies; but I have some doubts. About the oreo truffle bit, you said to mix in the cheese in parts till desired consistency is reached. What kind of consistency is good it to be spread over the brownies: semi-runny or more thinner? Is it easy to spread this layer of Oreo truffle on the brownie? I came to your blog for the first time via a link on Brown Eyed Baker...and just about died laughing reading this blog post, because it is SO FAMILIAR! I read it out loud to my husband and following conversation went something like this:, "That doesn't sound familiar at all." "Do I really do that??" "Not...often..." Hahaha! He is also very patient with me when I babble on about food and try new recipes. :) Anyway, these look divine and once I can properly eat again (I am on a restricted diet following stomach surgery a couple of weeks ago) I will be making them for sure. I can totally relate to thinking about food WAY too often! These brownies look so good!! Hopefully your hubby liked them as much as the truffles! Great recipe! Great results! I used 8 oz. cream cheese and added it to the crushed Oreos in the blender. Suggestion for the melted chocolate layer on top: Add some paraffin wax to the chocolate (I used chocolate chips). Add about 1/2 tsp. and allow to melt. Keep adding wax in small amounts until the chocolate is of spreading thickness. This allows for easier pouring, slicing, and a glossy finish. All of my willpower just flew straight out of the window! Holy wow! Oh Nikki - they look amazing!!! My birthday was this past Friday (7/19), so I made a batch of these and brought them into work. They were a huge hit! I'm forwarding your site to half of the people I work with so they can have the recipe as well. Delicious! I made this recipe today, I havent tried it yet but it looks amazing! (It's cooling for the oreo layer as I type this) Just wanted to say, maybe it was my baking dish, but mine took a lot longer than 20-25 min for the toothpick to come out clean. Probably an addition ten minutes! Just wanted you all to know, unless it was just me! I the picture it doesn't look like you did the top layer of drizzled chocolate. It looks more like chocolate shavings. I plan to make these and i'm just thinking once I put these in the frig to cool and take them out it will be hard to cut them with a solid chocolate top layer. Can't wait to try them though. These turned out amazing! I ended up using 6oz of cream cheese instead of 4oz. For me the oreo layer was the hardest part it wasn't spreading very easily. But once I got past that it was very easy. It turned out perfect! I would make these again. The brownie recipe also worked well for me. Everyone loved them! 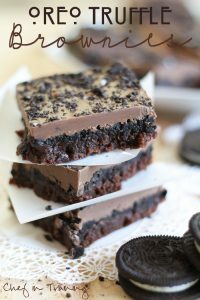 These brownies look amazing...can't wait to try them..serious preggy cravings...only problem is, I live in a town that only stocks regular oreo's and marscapone creAm cheese.. Will those suffice? I cannot WAIT to make these! I make Oreo truffles often, too, because they're always such a hit, but all that rolling and dipping is just exhausting. I'm hoping these can be a nice, less time-consuming substitute! Ok, I know cake is kind of traditional for birthdays, but the husband will melt over these! Definitely something to think about for me. I always search for recipes that involve ingredients i already have in my food cupboard and that are not too difficult, and this one doesnt seem impossible! Recipe calls for dipping chocolate. Could that be discs melted down - as in candy making? Do u use the cream of the Oreo? Or just the cookie part of the Oreo? I need to know ASAP!!!! These are totally amazing! I've made them with the double stuffed oreos and with mint oreos. Both excellent. I can't get the chocolate layer to stick, though. I only use 4 oz cream cheese, and I pat the truffle layer down. Maybe it will stick if I use more cream cheese so it spreads. The rest of the recipe works. I love your photos! Can I ask what font you use for the handwriting? i want to make these for a party in two days i have so much other baking to do i was wondering if there is any tips you may have to keep the browines fresh? 1) I live in Indiana and the only "baking" difference was that it took my oven about 30 minutes to bake. 2) I allowed the brownies to cool, but I spread the Oreo & cream cheese mixture while it was still warm hoping the cream cheese would melt and stick the the brownies better. 3) I let the chocolate on top set for about 30 minutes in the fridge (long enough that when I poked the chocolate it seemed like it was going to stay), and then I went ahead and cut it before the chocolate had time to get brittle. I then set it in the fridge overnight and had to re-cut it again the next day, but I didn't have any troubles with my layers separating or cracking. Or the whole thing. Also the picture looks like crushed Oreos on top. Don't see any melted chocolate? the whole cookie :) the chocolate is the top layer and it hardens up. These look amazing! Can't wait to give these a try. These look absolutely DELICIOUS!!! Thank you for sharing your recipe! I can't wait to make these!!! Your pictures are beautiful, but it looks like they're missing a layer of melted chocolate as described in the recipe and instead topped with the truffle layer and crushed Oreos. Am I missing something here? No the chocolate is the top layer, it just hardens up. I reserved a few oreo crumbs to sprinkle on top just to give it a pretty finish :) Hope that helps! Thanks. I wish I'd seen this before posting my question, just a short time ago, today. I'm making these for someone else, and will use your tip about reserving some Oreo crumbs to finish. This sounds wonderful!!! But the picture looks like it has thick frosting on it, not a layer of melted chocolate. Whatever, I definitely plan to try this - soon. Thank you for sharing. OMG!!! I have to try this, my partner has celiac disease and is lactose intolerant of dairy products from cows. I know there are plenty of products out there which are gluten-free I can use. Plus I have been using goat or sheep dairy products. Since we discovered he has celiac disease, I have been able to make cheese cake, brownies, cookies and many other desserts for him. Last time I made a dessert he loved, I was told that I can't have anymore, because he wanted the rest for himself. I think the first batch I make will be with cow's milk so I can have some all to myself!!! The recipe looks good but the picture doesn't match. I made these brownies today with a couple of changes. I usually don't like to change a recipe until I have made the original version first but I was short on time and ingredients so I used my favorite boxed brownie mix, Ghirardelli ultimate fudge brownies. I made the brownies making sure to undercook them so they don't get too cake like. Then I added the oreo truffle layer. I used a whole 8 oz of reduced fat cream cheese to get a nice creamy mixture that wasn't too dry to spread or stick to the brownies well. The brownie mix comes with a chocolate fudge topping that I put on top of the oreo layer. I didn't want a hard chocolate top on mine. They turned out really good! Next time, when I have the time and ingredients, I want to try the brownies from scratch. They will definately be made again for July 4th when all the family is here! I give this a 5 star recipe and would love to get more exciting recipes! My husband and everyone at my workplace can't wait to see what new brownie, treat I make next!! Thank you for sharing your WONDERFUL "Oreo Truffle Brownie" recipe. My friend at work made it and brought it into work for our boss's birthday. It was one of the best chocolate desserts I have ever had!! I'm planning on making this for my daughter's birthday this week! It looks like you put more crumbled cookies on top? The picture looks like there are more layers than is described in the directions. How thick is melted choc on top? Any clarification would be appreciated. They look delicious! Hi kindly tell what's the light brown layer on the top (in the picture) like a mousse?? The picture does not reflect the recipe. The chocolate topping is not there! what size package of Oreos should I use? These look amazing! Could you please email me the answer? Thank you so much! Betty this seems a fantastic recipe - they look seriously yummy. However while jotting down the ingredients to buy so that I can make two batches of these - one for the family and one for work colleagues, I became frustrated and gave up as the recipe is very unclear. You do not say what flour (SR or P) and is it Salted or Unsalted butter? Vanilla what...essence, extract, pods? Please be more clear as I am now abandoning the idea to make these- very disappointing. And I wish people would not use cups!! Grams,ounces please!! Made these yesterday, after some weights and measures conversions into UK friendly grams and a bit of educated guess work (thank you google!) about what you meant by dipping chocolate. All I can say is that they have gone down extremely well! The recipe seems to make a huge amount - I wasn't really sure how many brownies I'd end up with and I debated doubling the recipe to make sure I had enough for the small get together I was going to last night, but am I so glad I didn't! Six of us only got through half of the cake, and I have brought the rest into work this morning where they have been met with great enthusiasm. Great recipe (even though my brownie base turned out somewhere between a brownie and a sponge cake)! Kindly tell me asap should i use granulated sugar or icing sugar in that recipe?? Hello, can you make a step by step video of this recipe? I got a question: How many oreos are in 1 package? I'm from germany and we don't have the doubled stuffed oreos. The photo makes it look as if the Oreo layer is on top, but the recipe states to finish with the chocolate. If anyone's around to set me straight, thanks in advance. I absolutely love your recipes. I do wish though that you would have the number of servings on there. This is just the kind of recipe I've been looking for! While I don't observe any holidays except Thanksgiving, I did promise my coworkers I would make some treats; I had planned to make truffles, but after suffering a massively torn rotator cuff--in my right shoulder, and I'm right-handed, of course!--I knew I had to make something else (made truffles last week, and the pain of scooping and shaping them was unbelievable; won't do that to myself again!!!). This is going to be that "something else"! I made thse last night.... I think SIX 8 0z cream cheese MUST be a MISTAKE- at most you will need two packages of cream cheese. And the directions do not follow what the pics looks like?! Where exactly should the melted chocolate go according to this pic? The taste of the brownies is aahhhhmazing, but the directions are off on this. No, it means 6 to 8 oz. of cream cheese, not 6 - 8 oz. packages. We used one entire package and didn't use double stufs only cuz we don't like them. Hmm. These were good but my truffle layer was very dark in color and I used very nearly all of the 8 oz of cream cheese. How the heck did you get that light brown color? Same thing with the chocolate layer. Mine end result looked basically all the same, no layers. I am baking these right now. Just took the brownies out of the oven. I'm wondering if I did something wrong. They are way thicker than the way your picture appears, and they are very light in color. Did I do something wrong? TIA...Shannon I'm positive you can't mess up the taste, but I wanted them as pretty as yours! Not 1 thing in this recipe came out right....complete fail. I bake regularly so I'm not new at this...first 20-25 min no where near long enough, cream cheese layer never looked right and melted choc on top was just added mess. Goopy rich mess. So disappointing!! Anyone else?? Take this off of here, it isn't real!!! I am so sorry you ran into problems. I have made this recipe several times and haven't experienced that. The cream cheese layer is oreo truffle. It will be dark. You can add more cream cheese to get it to your desired consistency. And the chocolate on top can easily be omitted or just drizzled over the top so its not as thick. I am very sorry you had trouble with this recipe. I wish I could be more help narrowing down why that happened. I had great luck with this recipe until the chocolate layer for the top. I made the top layer 3 times. The first two I did it in the microwave like it said. It was crumbly and was not spreadable. The third time I melted the chips on the stove with more butter. It turned out exactly the same as the first two times. In the picture it looks smooth and creamy. Mine was not anything like this. I do not know what I did wrong. The other two layers tasted good but I threw out the whole dessert because of the top layer. Any suggestions?? These were amazing! Very very chocolate-y. I made them exactly according to the recipe. I used about 6 oz of cream cheese to get the consistency I wanted without it getting too creamy. Started with 4 oz then worked a bit more in before i stopped. Im not sure why some people had issues cutting it. I let it set up in the fridge for about 2 hours and then carefully cut it. It helps to cut in strips then into smaller pieces. If you find the hard shell separating, try starting to cut in the middle of the brownie versus the edge. It just takes a little patience :) I would also recommend letting these sit at room temperature for a bit before serving as my first cold piece was very dense but as the party went on the brownies became softer and fudgier! I want to make sure I'm making this the right way! Do I need 6- 8ounce cream cheese or 1- 6-8 oz cream cheese? Hi Nikki! These look fabulous!! I was wondering how far in advance I could make these? I tried to make these and it was a disaster. I am eating this as we speak and omg! This is delicous! It is so rich but the cake is fluffy. Thank you for sharing recipe. Hello!! I'm going to make them today!!! The dimensions of the pan are in cm? its a 9x13 inch baking pan :) Hope that helps! I almost scrapped this recipe after reading how many people struggled with it/didn't care for the results. I made it anyways, halved the recipe and made in an 8x8 pan. It turned out perfect, (baked about 30 minutes total, I'm in CO) not sure why so many people had problems?? After the brownie cooled to room temperature, I brushed a little of the melted chocolate on top of the brownie before adding the "truffle" part and it stuck together perfectly. I had no problems with chocolate cracking on the top with the oreos sprinkled on. I will say that I think I will try and find another way to make the truffle oreo part, it seems to be lacking a bit of texture/flavor with just the cream cheese and oreos, but its not unpleasant by any means as is. My husband and I have been gobbling them up, thanks! is there any substitute for eggs here ? I would love to try this one !! !